EL AÑO EN QUE NACÍ (THE YEAR I WAS BORN) is the January installment in FringeArts’ year-round programming at their Race Street Pier theater, and new proof of their commitment to bringing fresh work to Philly audiences. Created by Argentinean writer, director, songwriter, and performer Lola Arias, EL AÑO draws its content from its nine Chilean performers, whose parents lived during (if not, necessarily, through) the 1973 coup against Salvador Allende. 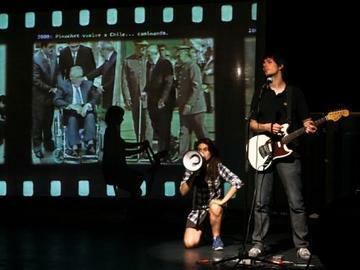 With the help of some fun projection work (not to mention ladders, shoes, paint, bicycles, and guitars), they recount personal stories of the strikes, journalistic warfare, real warfare, and uninvestigated murders that characterized Augusto Pinochet’s bloody 17-year dictatorship. Though the performers share a desire for blossoming social liberalism in Chile and freedom from the oppressive past, their parents include revolutionaries and counter-terrorists, civil servants and partiers, journalists and murderers, on all sides of the conflict. There is a dry humor throughout, a general dryness to the storytelling that invites us to laugh or cry while maintaining a straight face. 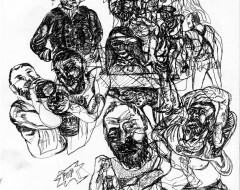 Pockets of high emotion sprout out of a generally rational, calm surface. Compared, for example, with InterAct Theatre’s recent WE ARE PROUD TO PRESENT (see our review here), similar in that it is playful devised theater about gruesome events, EL AÑO is almost emotionless. Perhaps because the story is so close to the lives of the storytellers. The result is that the play can be low energy at times, and transitions a bit clunky. A performance gains power when audiences know that it is true, particularly in the case when it is true about the performers, and it’s possible that Arias is depending too much on this power. However, it can’t be denied that the fascinating and mesmerizing EL AÑO works, and retains significant dramatic power. In a way EL AÑO isn’t so much a play as it is a mosaic, a chronicle of stories with theatrical movements. Through it, we explore the deeply varied perspectives that swell out of political and personal outrage, and the fractured histories which become common to all of us. 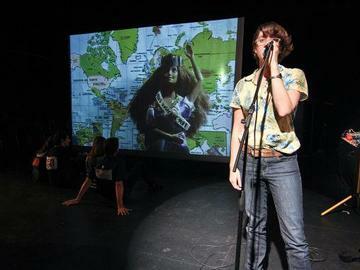 January 17-19, 2014, http://www.fringearts.com/.